As a beginner, choosing the right kind of swim cap (also called swim hat in the UK) can be challenging. Swim caps come in a multitude of materials, shapes, sizes, and colors. Even though a swim cap isn’t expensive, if you have to buy several swim caps before finding the right one, it can add up. Confused about which kind of swim cap you need? This article will give you an overview of what is available on the market so that you can find the best swim cap that suits your needs. But first, let’s explain why you should use a swim cap at all. Does a Swim Cap Keep the Hair Dry? A common misconception is that swim caps are designed to keep the hair dry. However, this isn’t the case, as a swim cap doesn’t create a waterproof seal around your head and some water always gets in. The only way to keep your hair dry is to always swim with your head above water, for example by swimming breaststroke this way. A swim cap protects the hair but doesn’t keep it dry. Why Wear a Swim Cap? Protects your hair from the chlorine in swimming pools. Keeps long hair out of the face. 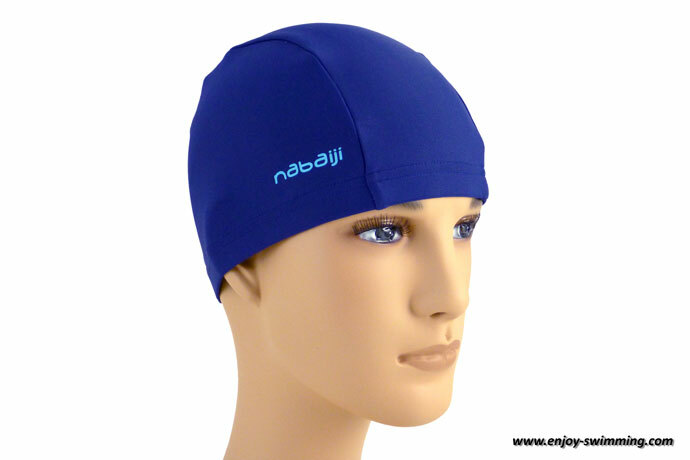 Keeps your head warm when swimming in cold or open water (if using a neoprene cap). Makes the swimmer more visible in the open water, especially if there is a risk of collision with boats, surfers, etc. Is mandatory in many swimming pools to avoid that the water filters become clogged with hair (if you are bald you may be exempted from this obligation). Allows you to swim a bit faster, which is essential in competitions. There are even competitive swimmers who wear two swim caps one on top of the other: one swim cap to cover the hair, then another one above the strap of the swim goggles to keep them in place and to further reduce drag. Let’s now cover the different kinds of swim cap materials. Latex swim caps are made of latex rubber and have been available since the 1920’s. They are very durable and are still the preferred kind of competitive swimmers as their tight fit gives a speed advantage. They always have a uniform color. 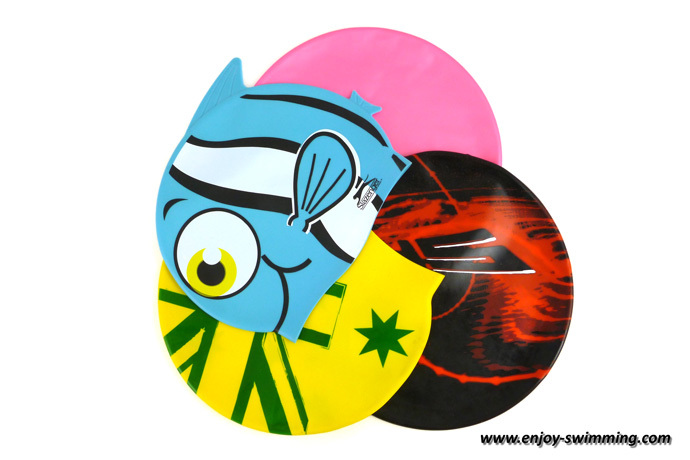 It’s also easy to apply a logo or write with a permanent marker on latex swim caps, and because of this, they are often used in triathlon competitions. They protect the hair well against the chlorine of the pools. They are however more difficult to put on and remove, and some people are allergic to latex. 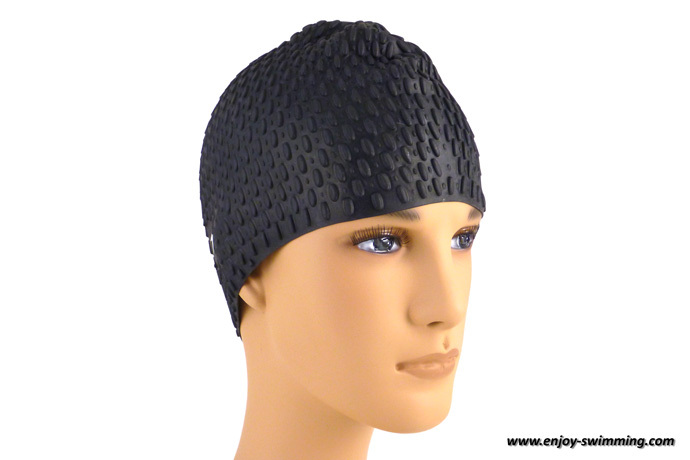 Currently, silicone swim caps are the most popular. They were developed as an alternative to people that are allergic to latex swim caps. They are a little bit more expensive than their latex counterparts. Silicone swim caps come in a great variety of colors and can even combine several colors. They protect the hair well against the water and are still flexible enough to be put on and removed with ease. However, they slip more easily than latex caps. A lycra swim cap is more comfortable to wear than a latex or silicone one. As they are made of the same material as your swimsuit, they can give you a more uniform look. They are also more durable than their latex or silicone counterparts. On the other hand, lycra swim caps tend to slip a lot, and they aren’t very waterproof. So they don’t protect the hair well from the chlorine. They are also the most expensive kind. The recurrent slipping of lycra caps can get frustrating. That’s why I recommend latex or silicone swim caps if you are serious about swimming. Neoprene swim caps are made of the same material as wetsuits used by surfers or triathletes and are designed to keep your head warm in cold water. This makes sense because you can lose a lot of heat through the head if you swim in cold water. Neoprene swim caps are thicker than swim caps made in other materials. They often have a dark color (black), have seams, may be padded on the inside and have a distinctive smell. They are also more expensive. Swim caps for children that are smaller than the regular ones. Choose these for your children. Swim caps of regular size for adults with short hair. 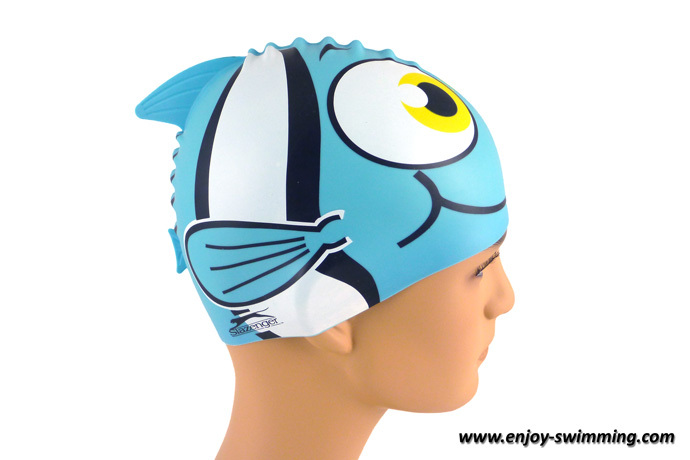 They fit most head types as the swim caps can easily stretch to adapt to the individual head shape and size. Swim caps for adults with long hair. They are usually an inch or two longer so that long hair is better trapped inside the swim cap. However, I wasn’t too happy with them when I had long hair a few years ago, as they tended to slip and let the hair out. The so-called bubble swim caps. These have a more helmet-like shape, and their surface is covered with small bubbles. They cover long hair well, and were the ones I used a few years ago. The look of those caps may not suit everyone’s taste, however. There are other interesting variations in the shape of swim caps. For example, there are swim caps with a small shark fin at the top that the children (and their parents) like a lot. Shark fin swim caps look funny, your children will like them! There are swim caps with straps to help them stay in place. There are swim caps with a retro flower look. You might not swim the fastest with them, but they can look cute. Some manufacturers offer swim caps with a custom printed logo of your swim team. So there is ample choice and choosing the best swim cap is also a matter of personal preference. The color of a swim cap is also mostly a matter of personal preference. However, if you swim in open water, it is better to wear a brightly colored swim cap. This allows nearby boats or surfers to spot you and helps to prevent collisions. Swim caps don’t need much care. After use, rinse them thoroughly under fresh water, then let them air dry, hanging for example on a washing line. The walls of latex swim caps tend to stick together. To prevent this, after drying, coat the inside with some talcum powder before putting them into your swim bag. I hope this article has cleared up some of the confusion that might surround swim caps. In fact, once you know about the four kinds of swim cap materials available, choosing the right type of swim cap should be easier. Which is better, bubble or silicone? You mean no precise type of swimming cap can keep my hair dry & away from water (waterproof), even a highly durable brand? I want to inquire about whether this classification differs from one brand to another or it’s nothing to do with the product itself being a brand? No, there are no waterproof swim caps. With colored hair should I swim or completely avoid it? I know that hair can turn green when it is bleached and comes in contact with chlorine. But since I am a man, I don’t know any more about the effects of swimming on dyed hair. Maybe a lady can give us additional insight? 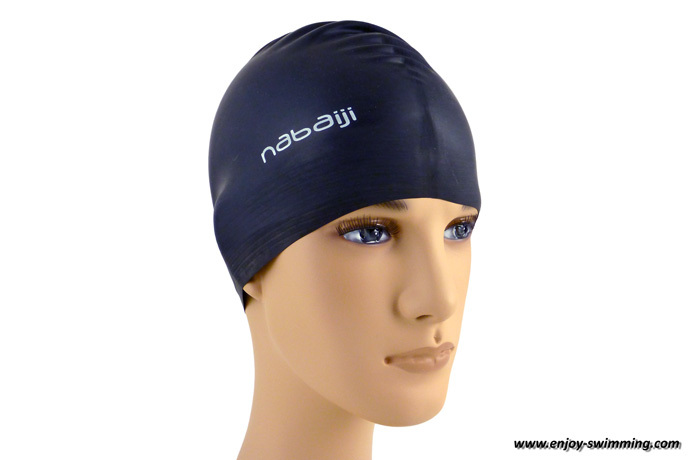 What swim cap is best for protection from the sun and is comfortable? My head is larger than most. Any swim cap should protect you from the sun. As for the best one for a larger head, maybe someone else will chime in? I am a small man and have a bald head. My head gets cold fast, even in warm swimming pools. What should I buy to keep my body heat from escaping during a swim? You should try a neoprene swim cap. They insulate best among the different types of swim caps. It’s the kind of swim caps triathletes use when swimming in cold water.